Performers include: Simon Baker, Dabney Coleman, Alan Rosenberg, Wendy Moniz, Raphael Sbarge, Charles Malik Whitfield, Denise Dowse, Kathleen Chalfant, Dorothea Harahan, Amanda Michalka, Courtney Stevens, Angela Featherstone, Rusty Schwimmer, Johnny Sneed, Rod Britt, and Erica Leerhsen. After a drug conviction, hotshot Pittsburgh attorney Nicholas “Nick” Fallin (Simon Baker) is sentenced to perform 1,500 hours of community service by representing children for the nonprofit Children’s Legal Services organization. Though initially reluctant, he soon becomes a vigorous child advocate and works with earthy boss Alvin Masterson (Alan Rosenberg), social worker Laurie Solt (Kathleen Chalfant), and fellow advocates James Mooney (Charles Malik Whitfield) and Louisa “Lulu” Archer (Wendy Moniz). Nick must juggle this commitment with working for his father Burton (Dabney Coleman) at his law firm defending corporate clients. At Fallin & Associates, Nick is assisted by Amanda Bowles (Erica Leerhsen) and works alongside Jake Straka (Raphael Sbarge). Absolutely a different and great show….I hope it continues…. Just got into this series on Netflix May 2014, excellent ! I’m just finishing this series now 05/14 (The Guardian) so sad it was only 67 episodes. This show was and still is excellent. Really pissed me off when it was cancelled. Great characters. Smart writing. Much better than dancing with anything or watch me I can’t sing. Really should consider a re-union program with characters intact as much as possible. 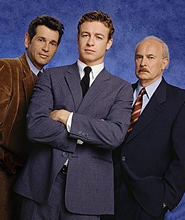 Simon Baker was really good in this program. I really enjoyed this show. Sad to see the series didn’t continue. Simon Baker played a good role. I agree the show was well-written and I liked the characters. I liked the role of Nick’s father as well.